What is Blue Print Reading? Blue print refers to a kind of reproduction based on paper which usually comes in the form of a technical drawing, engineering design and architecture documentation. Different materials are now used in the creation of a blueprint including paper, linen, polyester film and imitation vellum. Blueprint usually contains the structure of an architecture and construction project so it is advisable for you to gain a more comprehensive understanding about reading the whole material to ensure that you interpret it in the most accurate way possible. The whole blue print reading process actually works by understanding the newer and revised worksheets that are primarily designed to improve the ability of its readers to formulate a mental picture when looking into a drawing and effectively interpret it. If you want to become a blue print reading expert, then it is advisable for you to improve your skills in reviewing the main subject in a blue print with the help of examples and illustrations. It should also be noted that blue print reading encompasses understanding industry practices, standards and industrial printed copies in order for you to get a more balanced blue print presentation, thereby allowing you to read and understand the theories and industry applications associated to it. The process also includes defining various kinds of scales that form part of a drawing, accurately identifying the length, width and height dimensions and interpreting the different notations and symbols that form part of a blue print drawing. Blue print reading is not actually a difficult process and you can expect this to become even easier by taking part in a blue print reading certification program. If you want to take up a blue print reading course, then it is advisable for you to pick that highly impressive online certification course offered by Brainmeasures because it contains all the information that you need to become a real expert in this specific field. By enrolling in the blue print reading certification course offered by Brainmeasures, you will have an easier time accessing a more flexible and comprehensive blue print reading training which provides information about the different kinds of blueprints, steps and procedures involved in reading them and accurately interpreting the various kinds of standard abbreviations and symbols presented on wiring diagrams, schematics and electrical construction illustrations and drawings. 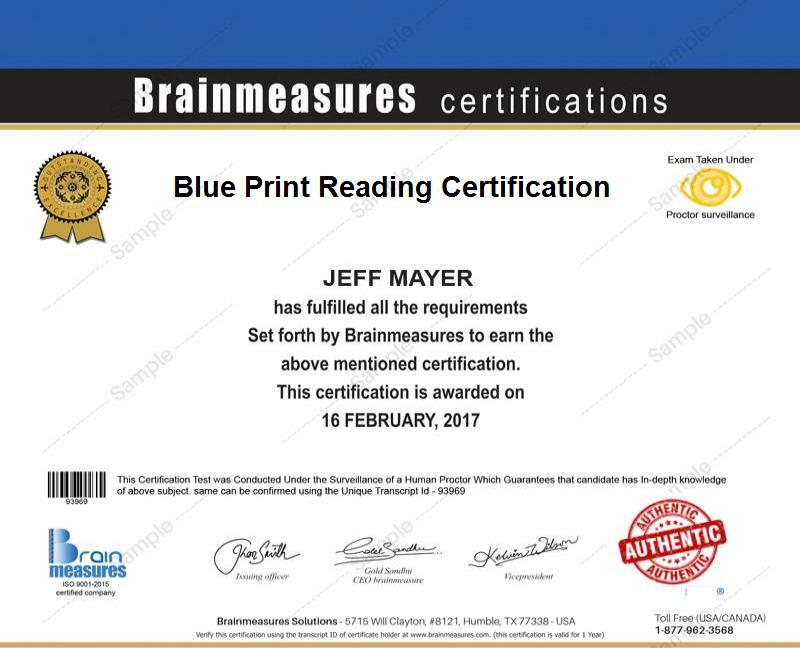 Getting your blue print reading certificate from Brainmeasures is already enough to show your excellence in the field of reading and interpreting all the major elements in a blue print. The blue print reading certification program offered by Brainmeasures can benefit numerous individuals and professionals especially those who are part of the engineering, structural, architectural, design and construction industries. You can expect this to work more suitably for beginners in the field of production and construction, junior fabricators, draftsmen, engineers, welders and any other professionals who are responsible in finding, interpreting and understanding vital information present in a blue print. Earning a blue print reading certification is a good way to dramatically increase the level of your income. With the help of your blue print reading certification, you will have an easier time getting the position of a blue print analyst which gives you the chance to receive around $49,000 to $81,000 annually. Working as a blue print consultant is also possible which allows you to earn as much as $140,000 per year.